An ab bench is a simple yet tremendous way to help build abdominal muscle that will in turn burn fat and sculpt your belly so that gorgeous abs can appear. Abdominal workout benches can be found in almost every gym, and it is easy to set up a bench in your home if you have the room somewhere such as a garage. There are many different types of ab machines that you can try, but many of them are complicated to set up and difficult to master. A workout bench is very intuitive to figure out and can be easily constructed. Despite being such a simple way to work out the abdominal muscles, there are several exercises that can be performed on one. A good ab bench can be found at several places both online and in physical stores. If you search online, Amazon is a good place to start. At Amazon you can find many different styles at many different prices. Amazon is a great place to find new benches that work your abdominal muscles, as well as a few used benches. Speaking of used abdominal benches, people are always trying to sell their used exercise equipment. You are certainly going to be able to find a good deal on eBay or Craigslist if you want to buy a used bench. Make sure to do some due diligence to make sure that you are paying for a high quality piece of equipment. The last thing you want is to be doing sit ups and have the whole thing fall apart underneath you. No matter where you purchase your ab bench, check around to make sure you are getting a good deal and a good piece of equipment, since you don't want the advantages of a bench to be cancelled out by a poor machine. The Pure Fitness Ab Crunch Bench is a great addition to your home, as it can fold down for storage to 37 inches x 20 inches x 8 inches. It is built on a sturdy 50 mm square and tubular steel frame. This helps keep the bench sturdy and steady no matter how intense the exercise. The ankle rollers adjust to four positions so that you can find the perfect place to hold your feet in place. 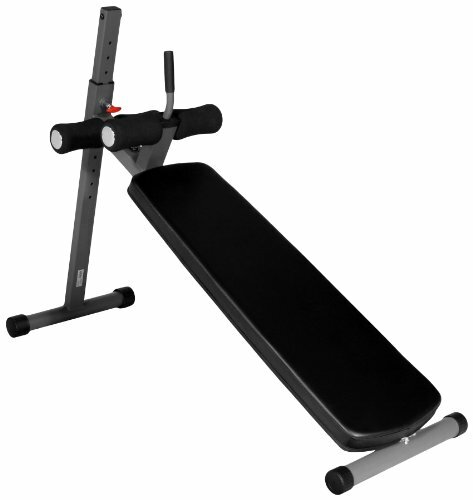 The Body-Solid GAB60 Adjustable Ab Board is an ab bench with 12 adjustable positions so that you can target the exact abdominal muscles you want to work. It has thick, double-stitched DuraFirm padding covering the 2 x 2 mainframe. The 8 inch rollers help your knees and feet fit comfortably so that you can exercise your abs with ease and comfort. The burning of your ab muscles should be the only pain you feel. Pain in your knees and feet should never be the reason you have to stop working your abs. To top it all off, this bench comes with a 10 year frame warranty. The equipment gets great reviews and many people have enjoyed the GAB60 adjustable ab board. Credit: amazon.comThe PowerLine PAB139X ab board is an ab bench that gets great reviews. The thick foam rollers are very comfortable for the legs, and the back pad is 22 inches long, which will make even the tallest person comfortable during an abdominal workout. The vinyl cushion is sweat resistant and is easy to clean. In addition, the finish is scratch and rust resistant and power coated. It has a heavy duty steel frame. In all, this ab bench measures 39 inches x 25 inches x 17 inches. There is a 10 year warranty on the frame and a 1 year warranty on the parts. Credit: amazon.comThe Stamina Pro Ab/Hyper Bench is a bench that makes it easy to do abdominal exercises as well as back extension exercises. With this machine you can work all ab muscles as you can set the machine in four different positions ranging anywhere from flat to a 30 degree incline. The positions are easy to adjust. It has a heavy duty 2 inch steel frame construction as well as hand grips that are easy to reach. One of the great things about this ab bench is that is folds down neatly, as seen in this picture. This makes it easy to store and hide away when you are finished working out. An ab bench is a quick and easy way to get in a good abdominal workout. A good ab bench allows ease of movement and is comfortable for your back and legs. There are several other good ab benches to try, but these listed here are four great ones to get you started.